I thought that I might share a little about my creative process in doing the mini tapestries. It’s so simple that it won’t take long. Reading Living the Creative Life and The Artist’s Way made me think about this, and I figure that it’s worth sharing. This is my current workspace in the Happy Room, on the futon that serves as a guest bed. Isn’t it a mess? 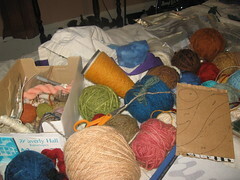 But it’s really working for me, like I have a palette of yarn. I found that the trick to keeping my creative energy going is to always have a little cardboard loom ready. It takes about five minutes tops to warp a piece of cardboard, which I prepare by snipping slits top and bottom 4 or 5 slits to an inch. You can’t really get a lot of detail with this method, but the simplicity and limit is part of the charm for me. For more detailed designs, I use a pin loom, where I can get 8 ends per inch. I could draw a design on the cardboard, but what I do with the mini-tapestries is that I begin with a blank cardboard piece, pick up a color, and begin. It helps a lot to have an idea prompt. 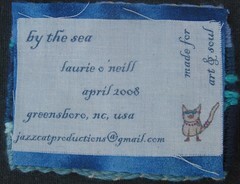 I have a theme right now of “By the Sea.” As I needleweave the yarn into the warp, an idea will begin to develop. If it doesn’t, I do a solid block of color. I figure that I can embellish the solid blocks with beads, shells, embroidery, or needle-felting later, so it’s definitely not a waste of time. The point is, I don’t wait for an idea. I just start weaving. If I’m not totally thrilled with it, it’s okay. I’ve only put a couple of hours into it at the most, and now that I’m interested in assemblage and collage, I figure that I’ll find a way to work with it later. In the meantime, I’m free to play, which is not something that usually happens with weavers. And playing was something that I struggled with so much that I even made “learning to play” a project for my “Creating Peace” class only last fall. If I get an idea for a more complicated idea, I’ll work that out later with a cartoon (design for a tapestry). I should make notes, but I have to work on that. It’s usually hard for me to stop weaving and start writing notes! I had a dream last night with an idea for a weaving that I awoke from and said to myself that I should write it down. Of course, the part of me that wanted to go back to sleep convinced me that I would remember this great idea in the morning. Of course, I have not remembered the details as of yet. I’ve had a lot of these dreams and they’re wonderful in their details, but by the time I get to the coffee, they’re a fuzzy warm pleasant feeling. So I need to work on my methods for recording ideas. Here’s a photo of the back of one of the tapestries. I designed these “signatures” in Word and copied eight to a standard 8.5 x 11 page, leaving a bit of space where I can attach a pin if needed, and then I used Ricë’s technique for printing them on a piece of muslin. I left the freezer paper on the back and cut them apart. Then I made hemmed backs of a watercolory-looking blue fabric to fit the back of each tapestry (using fusible webbing), fused those directly to the back of the tapestries, then peeled away one of my muslin signatures and fused that on top of the blue fabric. Here’s the (un-) funny thing – I decided to use fusible webbing for many of my sewing tasks to save my hands some stress and because I am such a klutz that I stab myself with needles and pins all the time. Well, here’s this fabulous alternative, right? I bought a little craft mini-iron that has a long rod handle and a little flat iron tip that I could use for little areas and corners where I might need more precision. So what was the first thing I did with my fabulous new tool yesterday? I mindlessly grabbed it in the wrong place and burned the hell out of my right index fingertip. If I don’t learn anything else from this hobby, I will learn mindfulness, the hard way if necessary.